Preheat the grill to medium high heat. Slice the baguette at an angle into 1/2-inch slices. Brush each crostini with olive oil & sprinkle with salt. Place a few pieces at a time on the grill for about 15-20 seconds per side until lightly grilled. Remove and place on a plate. Toss asparagus with 1 Tbs. olive oil and a good pinch of salt. Grill until tender-crisp. Transfer to cutting board and coarsely chop. Transfer asparagus to small bowl & combine with olives, remaining tablespoon extra virgin olive oil and herbs. Season to taste with lemon, salt and pepper. 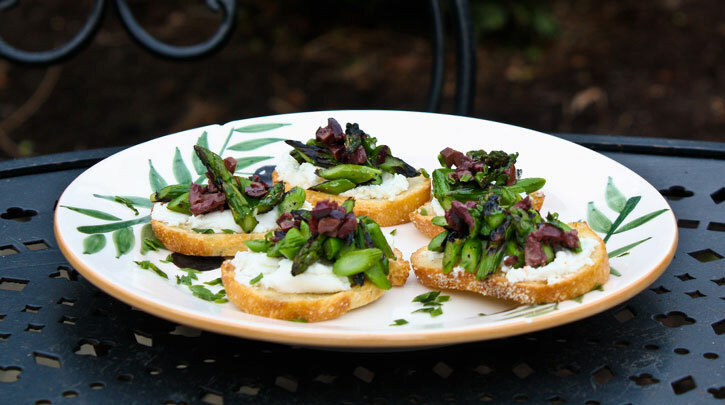 Top each crostini with a spoonful of goat cheese and some of the asparagus mixture.